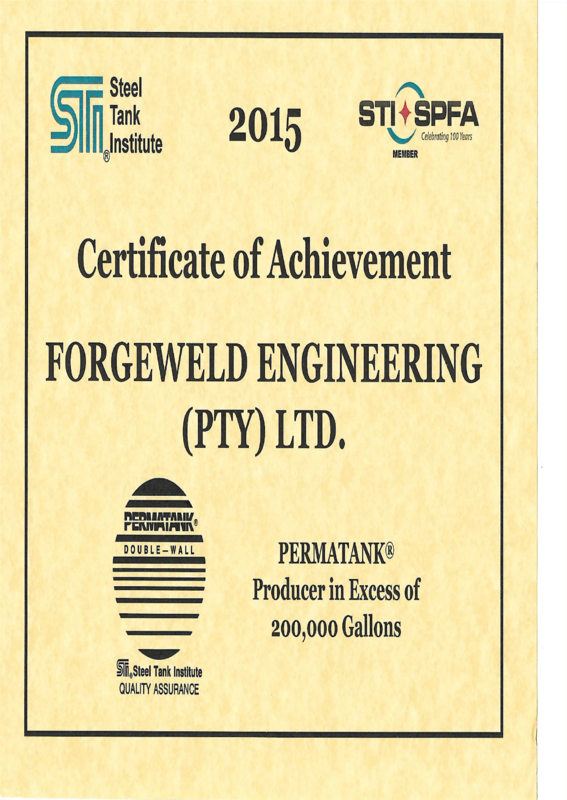 Forgeweld received the Gallonage Award for producing Permatank/Jacketed tanks in excess of 200 000 gallons in 2015. Unfortunately, Forgeweld was unable to attend the Annual STI/ SPFA (Steel Tank Institute / Steel Plate Manufacturers Association) 2016 meeting to receive the Gallonage Award for producing Permatank/Jacketed tanks in excess of 200 000 gallons in 2015. This revolutionary designed tank was developed by the Permatank ® Corporation in the USA in the 1980s. 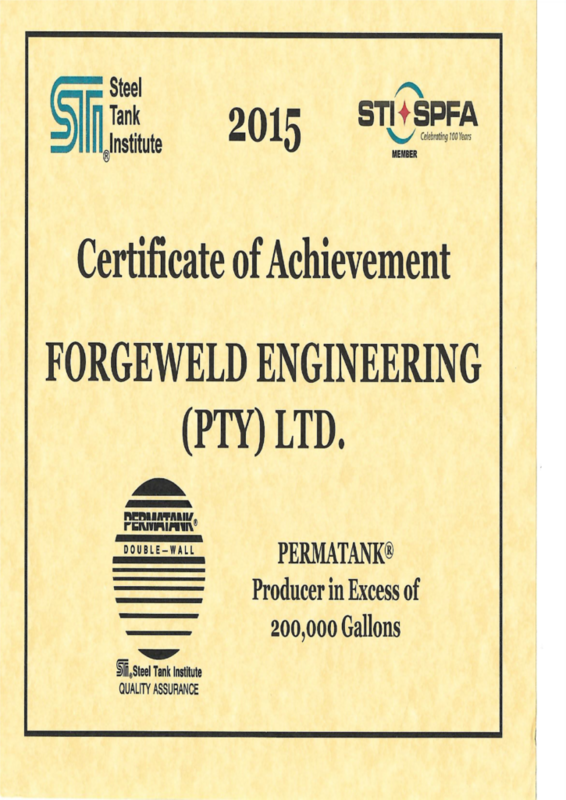 Forgeweld became an official member of the STI in early 1992 and has been manufacturing the Permatank ever since. Today we are one of the world’s major Permatank® producers and our market keeps growing. For more information on the Permatank® design feel free to scroll through our website or email us at info@forgeweld.com. In our previous edition we mentioned increasing interest in double wall technology for environmental reasons. 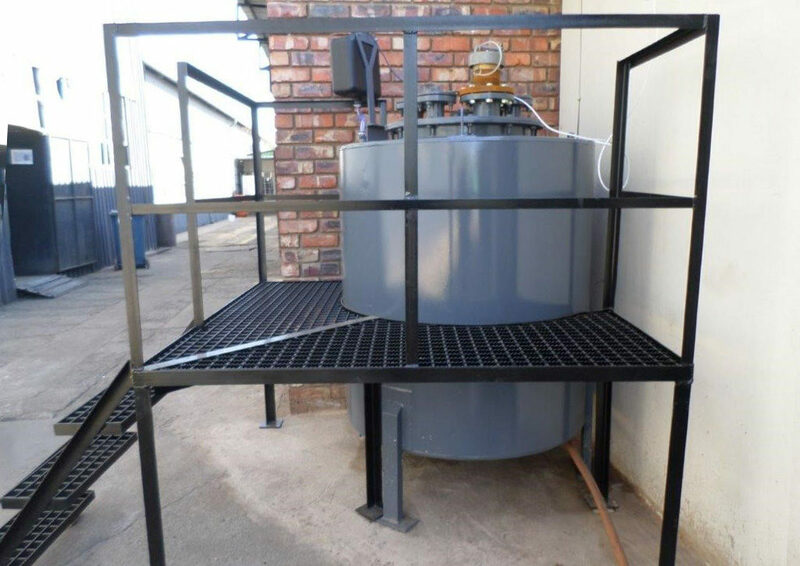 Forgeweld Engineering has since manufactured a double wall tank, installed at our Babelegi plant, for technical support and for understanding the function & operation of the wet leak detector system. Basic fault finding, daily inspection and operational training can be provided using the wet leak detection unit. The leak detector comprises a control unit, probe and container for leak detection (black LAG container). The control unit and the probe are connected by means of a two-wire signal cable with a maximum length of 50m. The probe is plugged into the top of the black LAG container. In the case of a leak in the interstitial space, the leak detection fluid level in the black LAG container falls. The probe’s electrode rods are no longer submerged in the leak detection fluid. The control unit detects the change in resistance and generates an alarm. Select an Aboveground Storage Tank (AST) below for more info. 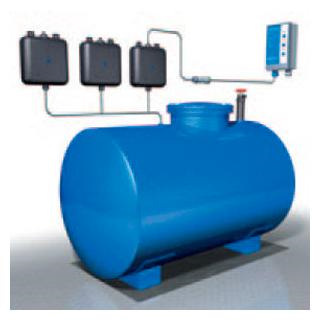 The tanks are supplied in standard sizes ranging from 1m3 to 100m3 but larger units can be manufactured on request. Generations of farmers have relied on the workmanship that goes into these fuel storage tanks that just last and last. Either mounted on cradles fixed to the floor or fitted with skids to enable easy repositioning where required on site. Specified for the storage of all blends of oxygenated fuels, including methanol with none of the problems associated with concrete-encased tanks. Select an Underground Storage Tank (UST) below for more information. The tanks are supplied in standard sizes ranging from 5m3 to 45m3 but larger units can be manufactured on request. Strength of steel meets the corrosion resistance of polyester in one tough storage tank for problem-free performance without any external corrosion monitoring. Permatank® or “jacketed tank” is the petrochemical industry’s best value in underground storage tanks. Permatank® Double-walled Tanks are not subject to rupture, cracking or the types of failure typical of other secondary containment systems. Forgeweld Double-walled Steel Tanks are built to last and use secondary containment technology to banish any concerns over environmental contamination caused by leakage. To keep your investment delivering at its peak, we supply a range of accessories and ancillary equipment. A number of our ancillaries are manufactured under licence from some of the USA and Europe’s leading suppliers. High Density Polyethylene (HDPE) thermoplastic piping systems is specifically dedicated to the oil market and chemical and petrochemical plants. A vast range of corrosion-free and leakproof fittings, spigots, mechanical fittings, entry boots and electro-welded couplers. A high pressure double-wall piping system that provides for more demanding containment and monitoring requirements.